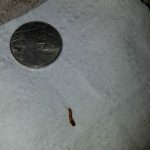 What Worm Is Wiggling Around on Bathroom Floor? 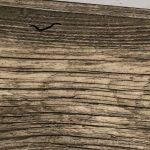 Although we can’t see a ton of detail of this worm, we believe it has a segmented body. We also don’t know its exact size, but we reckon it is pretty tiny. Finally, it has a round body shape rather than a flat, skinny one. So, what could this specimen be? We aren’t entirely sure what our reader has found in her bathroom. 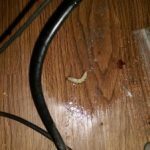 We can confidently rule out the three most common worm-like organisms found in bathrooms: bloodworms, earthworms, and drain fly larvae. Bloodworms and earthworms both have thin, red bodies, and drain fly larvae are extremley tiny with small hairs covering their thin black bodies. Based on the photograph, we think this might be a black soldier fly larva or some other type of fly or moth larva. 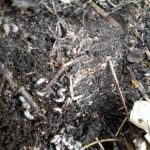 Black soldier fly larvae, or BSFL for short, are creatures that are commonly known for their composting abilities. They are excellent decomposers. They eat organic waste then return nutrients back to the environment. 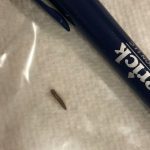 While these aren’t usually indoor pests, readers do sometimes find them in or near the trash or compost bin. If this is a BSFL, our reader will probably find more of them in the garbage bin. She can get rid of them by taking out the garbage and scrubbing out the actual trash receptacle. If this isn’t BSFL, it is likely another species of fly or moth larva. It could have gotten in the bathroom through an open door or window, or been accidentally dragged in by a pet or on a shoe. 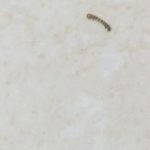 As long as our reader’s bathroom isn’t crawling with these larvae we don’t think she should worry too much about this single larva’s presence. 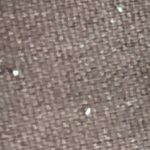 If our reader gives her bathroom a proper scrub down, and ensures that her windows and doors are properly sealed, she hopefully won’t experience any more visits from these larvae! 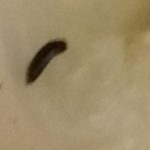 To sum up, a reader sent us a photograph of a black larvae she noticed on her bathroom floor. We think this might be a BSFL, but we aren’t 100% confident. 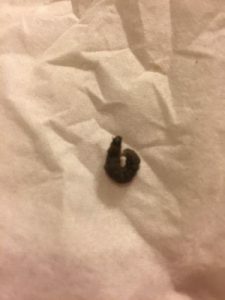 A reader sent us a photograph of a black larvae she noticed on her bathroom floor. We think this might be a BSFL, but we aren't 100% confident.